Installation of the MarinePaq facility for Scandlines at the Port of Gedser. 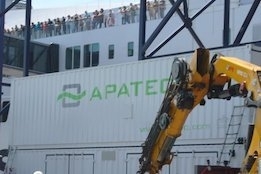 Luxembourg-based clean-tech company APATEQ – PWT S.A. (﻿APATEQ) today announced that Scandlines is using a new scrub water treatment system produced by APATEQ at the port of Gedser, Denmark. The MarinePaq system cleans scrub water from Scandlines ferries' closed-loop exhaust gas cleaners in a five-step process, producing cleaned water that can be discharged into the harbour waters "according to the most stringent environmental legislation and achieves substantial savings on operation costs and flexibility gains for the fleet," explained APATEQ. The system has been installed in two containers stacked one on top of the other at Gedser's harbour. "By operating the MarinePaq on shore, Scandlines may save expensive water disposal costs for hauling the scrub water to the nearest industrial wastewater treatment facility," said APATEQ. "The shipping company is also not dependent on the availability of external water disposal providers, thereby saving time and gaining flexibility. As the scrub water does not need to be treated at centralised wastewater treatment plants anymore, the MarinePaq contributes to a relief of these often overloaded facilities." The system is being used by two of Scandlines' recently launched ferries on the Rostock-Gedser route, which are driven by hybrid propulsion systems, combining traditional bunkers with electric battery power. The two ferries have also both been fitted with a closed-loop scrubber with contaminated water from the scrubber channelled to an onboard separator for purification. When the solution cannot absorb more waste products, the scrub water is pumped into the shore-based scrub water treatment system. "The onshore treatment of the MarinePaq also achieves a much higher quality of purification than any other existing scrub water treatment system, such as the ones offered for on board applications," said APATEQ. "Heavy metals, COD, nitrite, sulphites and nitrates are being reduced to much lower levels than any other solution currently implemented. As a result, Scandlines may count on an infrastructure that is capable of facing toughening and constantly evolving regulations." In 2015, Scandlines said it was targeting a fleet of six battery-powered, zero emissions vessels by 2018 - the next step toward the company's zero emissions goal.